Well, so I’m a few minutes late getting to the party on this issue of tweets, twits, stones…whatever. Okay, maybe it’s a few days. On the other hand, I don’t see any of you paying me to write these blog articles (he says with a wink). And people have been paying me to represent them in court. For the record, your honor, I’ve already said that I believe it was [two agencies I listed]. But I am certain of one thing: neither I, nor my client, were part of the group of 25 officers who arrested him. I suspect if the warrant—of which I don’t have a copy—were tracked, the prosecution might be able to find out who made the arrest. Or maybe he could ask someone at the jail. After all, it’s not like they’re going to talk to me, and give me the answers. Or very similar words to that effect. So, you see, I have been busy with various and sundry things, and unable to get to the party, with all its psychedelic lights, and seizure-inducing whatevers, until now. In any event, I’m here now. And I’m reminded of something that happened to me perhaps more than twenty-five years ago. Amazing to think that the Intertubes have been tubing that long. A quarter of a century. But they have. In fact, intertubing has been happening even longer than that. The incident I am going to tell you about, unless my ancient memory fails me, occurred even before the invention of NCSA Mosaic, one of the first “graphical” web browsers. Or maybe it was right around the same time Mosaic came out. As I said, it’s been a long time. You see, there used to be this thing called “Internet Relay Chat,” a.k.a., “IRC.” I believe it still exists today, although I haven’t used it since shortly after I left my undergraduate university in 1995. Now, I’m not looking to revive old wars here, so I’m being deliberately vague about things like names of channels, names of people, etc. But at least one of the channels on which I hung out was important to me because I utilized it for my work. One day, myself and another self-important person got into a tiff. For those who grew up only on intertubes, that means “a petty quarrel.” Given what this post is about, I figured I better specify that we did not get into a Tag Image File Format (TIFF). It really was petty: the other individual was an admin and a pedant, and kept banning people for such silly things as improper use of English grammar, even if it was only a single occurrence. I called him on it, a verbal fight ensued, and he banned me. Someone else unbanned me; I banned him; someone unbanned him; he banned me again. This kept on, and, because we were both immature and had supporters, it caused a huge disruption. In the midst of this, however—and I was not an attorney at the time—I (rather ignorantly, I now realize, as I had no clue then about how the law worked) threatened to take some kind of legal action because he was interfering with a resource I utilized for my work. That threat to violate the law against opening portals between universes cost me a number of supporters. I tried explaining the reality that what he was doing was disrupting my ability to complete certain projects. But, in numerous lengthy discussions about the relationship between IRC and RL, it didn’t matter: the rule was deemed inviolable. Ultimately, I lost that fight in the Court of IRC Opinion. Now, in retrospect, there were any number of ways I could have dealt with this situation. Perhaps none of them would have been as satisfactory as the one I wanted, which was to have Mr. Pedant back off, and leave me—as well as those others he tormented to make himself feel important—alone. But I could have found—hell, I probably did find, although I don’t remember the final outcome of all this more than 25 years later, except that I did not pursue any threatened legal actions—another way to deal with the situation. But I’ve never wavered in my belief that I was right about this one thing, and that so many others were wrong about it: the rule against opening portals between the universe of IRC and RL was a bogus rule, based upon a bogus belief that IRC did not “really” matter to RL. Actions on the Intertubes can, absolutely, have real-life impact. 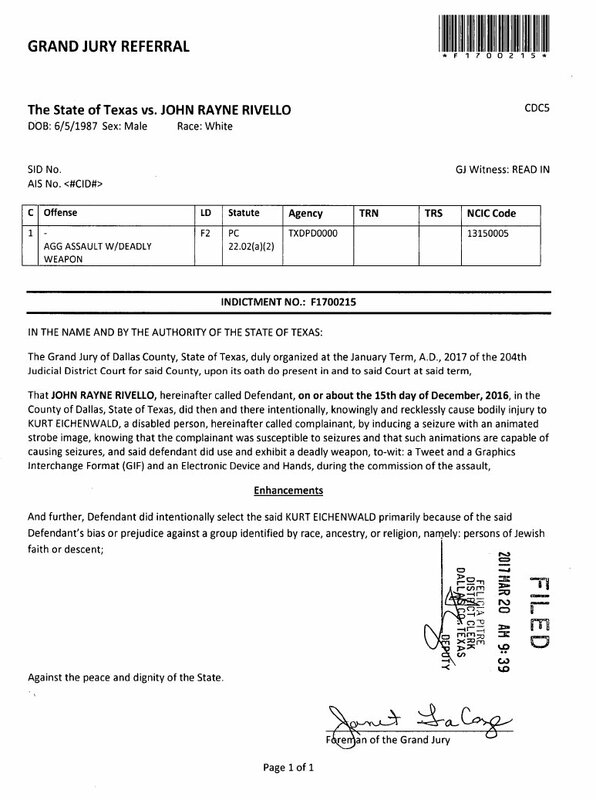 The charges against John Rayne Rivello* for sending Newsweek writer Kurt Eichenwald, “a disabled person,” a twit with a flashing GIF raise a great many issues that, beyond whatever twisted notions compelled Rivello to do such a thing, create challenges for criminal law. Rivello has been indicted federally, and locally. The latter jurisdiction has charged him with aggravated assault with a deadly weapon. And Scott gets into the definition of the phrase “deadly weapon,” which leads him to the question of whether, or not, a tweet is a weapon. As Scott parses it, a tweet that “fires” a GIF at someone is not the same as a gun that fires a bullet at someone. Scott’s concern is that a tweet, or a GIF—his discussion starts with tweets, but switches to GIFs —is not a physical thing, and only physical things can be deadly weapons covered by the relevant statutes. In an update after his original post was published, Scott linked in Eugene Volokh’s article, “Crime on the virtual street: Strobe lighting, ‘virtual groping,’ and startling.” That article contained a link to Volokh’s more complete article, “Law, Virtual Reality, and Augmented Reality.” Both are well-worth taking the time to read, for those (like me!) interested in such things. Sorting out who is responsible will require courts to understand the technology and how it differs from the world that came before. But it won’t necessarily require a fundamental rethinking of legal doctrines. I tend to agree with Volokh. I was already predisposed, as Scott noted some people would be, to see the twit, or an email, or an instant message of some kind, as the gun that delivers the bullet, or payload, of (in this case) the potentially-deadly GIF. My thinking on that was that a thing is a thing is a thing. And unless you specifically state that “anything” does not include non-material things, then it does. We base many rules on the distinction between the mental and the visceral, between things we perceive and things we experience. VR and AR will make it harder to draw that line, and may push us to think hard about why we punish certain kinds of conduct and not others in the physical world. Indeed, they may even lead us to rethink the notion of what is “real” in a world where more and more of our most significant experiences aren’t “real” in the classic understanding of that term. There’s a lot going on when it comes to the question of what the meaning of “real” is. But we don’t even have to get very metaphysical to see that what was done to Eichenwald can, indeed, count as an assault with a deadly weapon. Because, you see, both Scott and the prosecution are looking at the situation between Rivello and Eichenwald and misidentified the components of their interaction—or perhaps, it would be better to say that they cherry-picked the components upon which they each focused, because both left out parts. I once defended a client in a case that included a charge of assault with a deadly weapon where the weapons were sticks and tree branches. There’s no principled reason I know of why an actual stroboscopic light could not count as a deadly weapon. To get from this to viewing what happened to Eichenwald as an assault with a deadly weapon, we just need to ask how does this strobe light thing—and here I’m using this “real-world actual thing” thing to satisfy Scott’s definition of a thing—work? It’s like this: I turn on a switch, and electricity from a battery (via chemical reaction), or electrical outlet, “activates” the light. The light somehow moves through space to your eyeballs. This results in stimulation of your optic nerves. Your optic nerves convert the “real world” strobe light signal into electrical impulses that traverse neural pathways leading to the brain, leading potentially to a seizure in certain people. People like Eichenwald. Depending on what he was doing at the time, Eichenwald foreseeably could choke to death on his own tongue, or fall down and break his neck, or his arm—he could probably be injured, or die, in any number of ways. Now, in a veridical sense—I’m trying to avoid the use of the problematic word “real” here, but there’s not an easy way to do it; even “veridical” means “coinciding with reality”—does it really (?!) matter if instead of flipping a switch on an actual stroboscopic light so that electricity causes the light to trigger your neural reaction, I push a button on my keyboard so that electricity causes a light from your viewing device to trigger your neural reaction? And the circuits traveled are a little longer than those inside a hand-held strobe light? …defendant did use and exhibit a deadly weapon, to wit: his trigger finger, a strobe light, a battery, and a bulb. A lot has changed since the days when a pedantic prick used mere words to negatively impact one aspect of my social and work life. The Intertubes have evolved, not just in capability, but pervasiveness. But here’s the crux of it: the connection between Rivello, and Eichenwald, was real. The weapon used might be a bit more complicated, but it still consists of very real components. Call them electrical impulses, switches, photons, twits, strobe lights, pixels, GIFs, or what have you. Want to really wig out? The Internet can not only be a deadly weapon: it could be used as a weapon of mass destruction. Twits and stones can break your bones. The asterisk indicates a footnote on Scott’s post, which I don’t include here. And he notes that the physicality issue is equally applicable to both. Another influence from Scott: he tends to refer to tweets as twits. I think it’s because of the obvious connection between the vapidity of most tweets, and the ordinary meaning of the word “twit.” I’ve taken to using it that way, as well. People v. Russell, 129 Cal.App.4th 1182 (2005)(throwing someone in front of car counted as “using” car as deadly weapon); People v. Coe,165 A.D. 2d 721 (N.Y.App.Div. 1990)(thrusting person’s head through window counts as “using” window as a deadly weapon; State v. Reed, 790 P.2d 551 (1990)(sidewalk used as deadly weapon). I know it’s not magic, but I’m not a physicist, and this isn’t a physics paper!